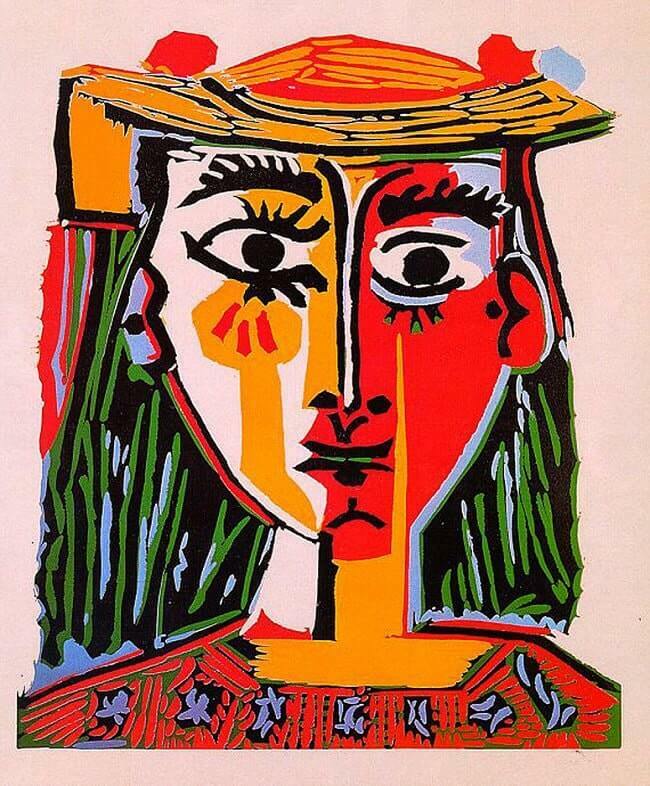 Picasso drew a number of variations on the Woman in a Hat theme during the winter of 1961/62. Zervos reproduces it together with ten other versions, all of them dated 12 January or thereafter and all painted in the same technique. Two drawings dated as of 14 January come closest to the one shown here. Different from the others in the series, the heads are portrayed entirely full face and without any multivisual allusions. One feature needed to be noticed is the asymmetrical treatment of the eyes: the left eye seems to be staring lifelessly into space, while the right eye makes a "naturalistic" impression. A similar depiction of eyes may be observed in one of Picasso's late paintings. Head of a Woman in a Hat probably depicts Jacqueline, whom Picasso married on 2 March 1961, and with whom he soon afterwards moved into the Villa Notre-Dame-de-Vie at Mougins.